Agra - 4' 5" x 7' 6"
During the Mughal dynasty of India in the sixteenth century Agra became a major center of court carpet weaving. Many of the finest Mughal carpet masterpieces of the sixteenth and seventeenth centuries, those woven under the great rulers Akbar, Jahanghir, and Shah Jahan, were produced in Agra. In the course of the eighteenth century, however, the Mughal state disintegrated into a period of petty principalities under Rajahs who eventually succumbed to conquest by the expanding British Empire. As a consequence of this, rug production in India declined as a major industry or artistic medium, until the British colonial authorities began to resuscitate it in competition with the great rug revival in Iran in the latter part of the nineteenth century. At this time Agra and various other Indian cities once again emerged as important centers of rug production geared largely for export to the western markets. But such later Indian production was driven largely by commercial motives, and it rarely reflected any of the artistic quality or cultural authenticity of the rugs produced under the Mughals. This exceptional little Agra is something altogether quite different. It was woven well before the commercial revival of the late nineteenth century and represents an extremely rare and genuine survival of the Agra weaving tradition during the period of British rule. The design of the field consists of 'Boteh' motifs, known to the West as 'Paisley,' arranged in staggered horizontal rows. Unlike most Boteh designs, this one has a subtle mesh of thinly proportioned vines that outline the Botehs and unify them into a continuous pattern or composition. A closer look reveals tiny birds sitting astride the linking vines. Each Boteh is a design unto itself, filled internally by complex little patterns of flowering trees or shrubs. The successive rows of Botehs shift alternately to the left and right, establishing a subtle but dynamic rhythm for the entire design. The borders are narrow in proportion, yielding pride of place to field. The inner three have finely wrought vinescroll designs. The outermost border is a reciprocal pattern of trefoils or fleur-de-lis with miniscule internal embellishment. 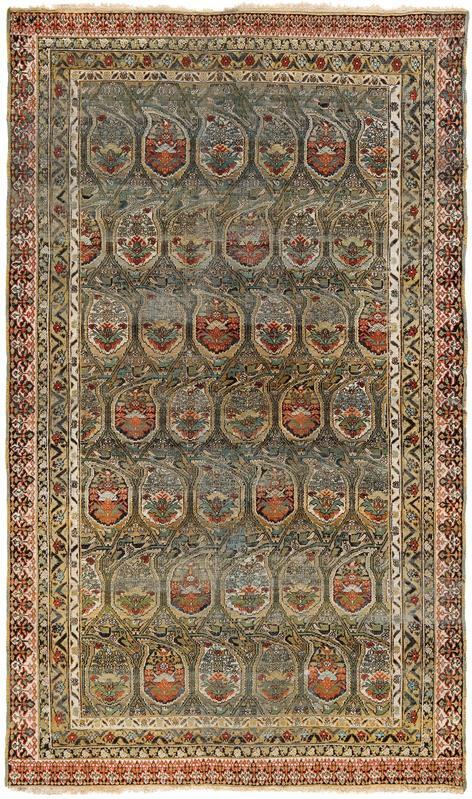 Given the various design elements, this rug appears to be a rare adaptation of or response to the meticulously woven and embroidered shawls of Kashmir produced somewhat further north. The weaver was only able to adapt the minute ornamental vocabulary of the shawls because of the unusual fineness of the weave, with some two hundred knots per square inch. The palette in varied shades of green, rich, pungent red, and luminously white ivory, however, owes little to Kashmir shawls. It is classic Agra, in keeping with the finest Mughal traditions. The quality of the wool is also reminiscent of the Pashmina wool used in the great Mughal carpets. This piece constitutes a rare example of authentic Indian weaving art, produced locally for discriminating Indian patrons rather than commercial export. It is in fact a proud homage to an indigenous and authentic tradition of Indian textile and carpet art that was struggling to maintain its creative autonomy under colonial rule. As such it embodies that special rarity and authenticity which antique rug collectors prize above all.